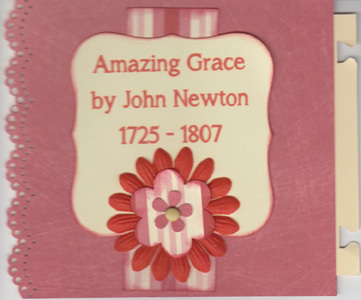 For this first challenge for this year of 2012, Patter has given us the hymn "Amazing Grace" by John Newton. This is a favourite hymn of many people. I can remember that before I became a Christian and I heard this hymn I thought that "Grace" was a woman. How wrong I was - the love of a woman is nothing compared to the Love of God. How wonderful is His GRACE. There is nothing we can do to deserve the gift He offers to each one of us. Which is why I chose the verse I have used on my paper art piece and I had the verse already on a rubber stamp which was good to discover. Now I will be sharing firstly my digital art which will each time depict the hymn and then I will share my paper art which will be the scripture that the hymn inspires me to share. For my digital art I used a kit called A Simple Day by Armina Designs, the hymn sheet was among my commercial use items and I did not have noted who the designer was. The font I used for the title is called A Song for Jennifer. This is lovely AM. 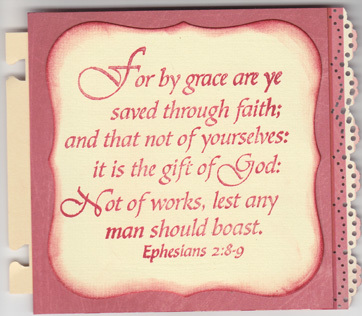 You are so right about that wonderful gift of grace. 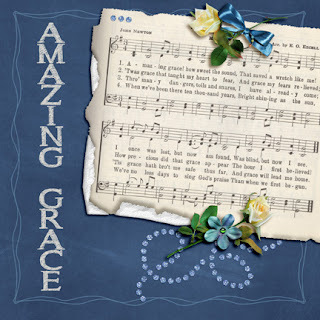 I remember reading in Phillip Yancy's What's so Amazing about Grace? that Christianity is the only religion that teaches about God's grace. It is a wonderful gift of the Father, a gift that some of us find difficult to open and use. Blessings to you in the new year. Beautiful and a woderful way of displaying your pages! Look forward to your beautiful work again this year. God comfort you as you go through this difficult time with your mother.